Exceeding already high expectations, Snowglobe Music Festival 2018 was truly outstanding. With frigid weather conditions and a stacked artist lineup, attendees braced themselves for the music festival in the snow. This year’s edition of Snowglobe Music Festival in Lake Tahoe had truly outdone itself, providing patrons with beautiful stage designs, an assortment of food and drink stations, and an artist lineup that had people buzzing with anticipation for months. Snowglobe Music Festival differentiates itself from other festivals, taking place in the snowy winter environment. The festival, which is held in beautiful South Lake Tahoe, doubles as an end of the year music sanctuary for dance music fans and EDM fanatics. Like previous Snowglobe editions, the event possess three full days of music and also brings in the New Year. This year, legendary trance trio, Above & Beyond, performed a euphoric main stage set to set off New Year. While the Anjunabeats trio was a surefire highlight for us, well-known acts such as REZZ and Diplo closed out the main stage on the first and second days. Snowglobe 2018 stacked comparatively against previous years, increasing their stage production and general catering to attendee. 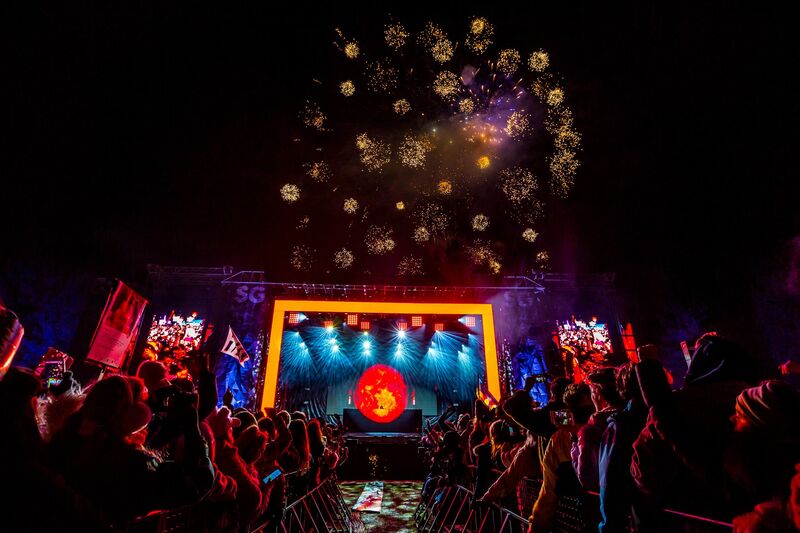 The festival was recently acquired by established media network, MTV, and displayed many noticeable improvements in this year’s stage designs, talent roster, and overall production. Taking place in below freezing temperatures, Snowglobe 2018 acted as a special, unique, winter wonderland. The falling snow appeared as sparkling glitter as it blended with the lights and lasers from the festivals epic stages. Additionally, the surrounding pine trees from the forest made for a mysterious yet comforting environment, creating a beautiful and natural aesthetic. Helping festival attendees battle the frosty weather conditions, Snowglobe 2018 possessed several food and drink stations. Besides your standard pizza, taco, beer, and liquor stands, Snowglobe-goers also had the options of hot noodle bowls, spicy curry stations, and even alcoholic hot chocolate. Helping partygoers fill their stomachs, refuel their energy, and battle the frigid weather conditions, the stations served as a Snowglobe must. This year, Snowglobe possessed established artists such as REZZ, Diplo, Above & Beyond, Kaskade, RL Grime, Big Gigantic, Ekali, Medasin, Tyga, Goldlink, and many more. Additionally, the festival in the snow also hosted many up-and-coming artists such as 1788-L, CharlestheFirst, Pax Impera, and Cray. Overall, Snowglobe Music Festival 2018 proved to live up to its name, serving as a musical winter wonderland. The festival in the snow was a heart-warming way to bring in the New Year. Garnering such praised reviews and success in 2018, we’re looking forward to what’s in store for Snowglobe 2019. Check this space for all things Snowglobe as they are announced. Discover more about Snowglobe Music Festival here.